A closet upgrade is a quick and easy way to improve your home and life. Whether you have an inefficient wire closet system, an old-fashioned single hanging rod and shelf that are not utilizing space effectively, or you’re just wishing for something more functional and aesthetically pleasing, upgrading a new home’s storage space or remodeling an existing closet can be very rewarding. Here are five ways a custom closet that you design and build yourself can provide a good return for your investment. 1 - Maximize your storage space. Deep corners, tall ceilings, angles, or unusual shapes can lead to wasted space that fails to optimize your full storage potential. The solution to making the most the most out of the space you have? A DIY closet organizer that is custom-made to fit your space! To maximize vertical storage, choose shelving, drawers, or hanging storage with tall floor-based vertical panels, or opt for a wall-mounted system that doubles storage for hanging clothes. 2 - Fit your wardrobe to a tee. When you design your own custom closet, you can customize it to your wardrobe and add special features that make it easier to keep everything organized. Include shoe shelves, drawers, baskets, belt racks, hidden hampers, or even a fold-out ironing board. Because a DIY custom closet is so flexible, it’s simple to add more storage options at a later date. 3 - Streamline your routine. Is your closet becoming a catch-all space? Crowded rods and shelves, gaps that let items fall through wire shelves, and piles of disorganized shoes can make it challenging to find what you need quickly. With an upgrade to a wood-based custom closet system, those issues simply disappear. You’ll be able to better visualize your options, have a place for everything, and stay organized much more easily. 4 - Create a welcoming space. Yes, your closet can be beautiful and functional. With a custom closet system, you can choose the color, style, hardware, and storage features that meet your individual preferences. If you include built-in drawers, you can also create a premium custom look and add more living space by moving dressers out of your bedroom. 5 - Add lasting value. A custom closet system that’s made by a reputable company and backed by a solid warranty means you can buy with confidence and get a solution you’ll love for years to come. It also adds personality, convenience, and a “wow” factor that will appeal to future buyers if you ever choose to sell your home. Your closet is something you interact with morning and night. 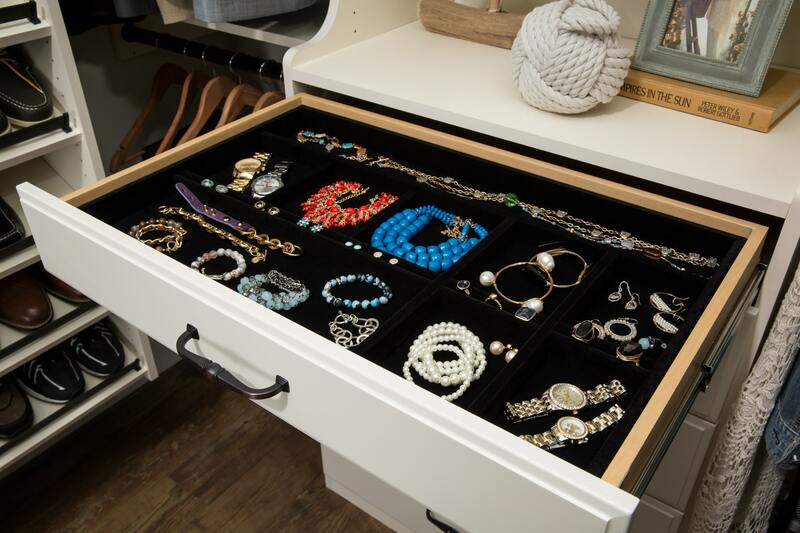 By upgrading your home with a DIY custom closet organizer, you can enhance your everyday life and add beauty and value to your home.